This old Walachian silver coin belongs to the collection of Mr. Bogdan Costin, through the kind permission of whom the pictures are present on Romanian coins. This coin was issued by Radu I (~1377 - 1383), brother of the famous Vlaicu I (1364 - ~1377) and father of the glorios Mircea the Old. This voivod (reigning prince) achieved for the first time for him and his descendants the title of Great Voivod (appearing on coins also). 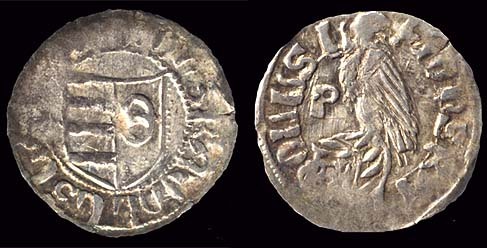 Yet short reigned, a large variety of silver coins comes from his period. Walachia (i.e. the Romanian Country - Ţara Românească) has known under Radu I Basarab a nice flourishing period. Being mentioned in front of the remembrance lists (for the living to ask peace for the souls of the departed) in many churches and monasteries (as their founder), Radu was confounded by the popular belief with Black Voivod, the legendary and hypothetical founder of the the state so that, from the 16th century on, he was thought to be the first ruler of Walachia as its founder. 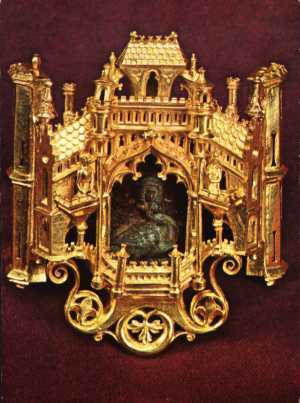 The reliquary golden buckle of Radu I was discovered in his tomb in the princely burial abbey of Curtea de Argeş. It is an adornment artifact of great detail and complexity: it presents a fortress of Gothic style, with towers, building bodies, arcades, balconies and roofs; centrally it displays a woman headed swan flanked at right by a knight and at left by a lady. Curtea de Argeş continued to be the royal burial ground after the creation of modern Romania. Carol I (who joined figuratively and literally the old founders), Ferdinand and, just recently, Carol II (put to rest again on February 14th 2003, the second day after his earthly remains returned from Portugal) are resting in the same holy place. The legends on the coinage of Radu I were written both in Latin and Cyrillic (Slavic). This one uses Latin. There are plenty of akin variants in which concerns the legend, its respective fonts and of course misspellings.